At age 12, Almaz Egiziabher was living in poverty alone on the streets of Addis Ababa, Ethiopia, Africa. Her mother had died, so Almaz fled to Addis Ababa, Ethiopia’s capital city, to escape her abusive stepmother and indifferent father. She arrived optimistic about her life, but was soon dealing with a harsh new reality. 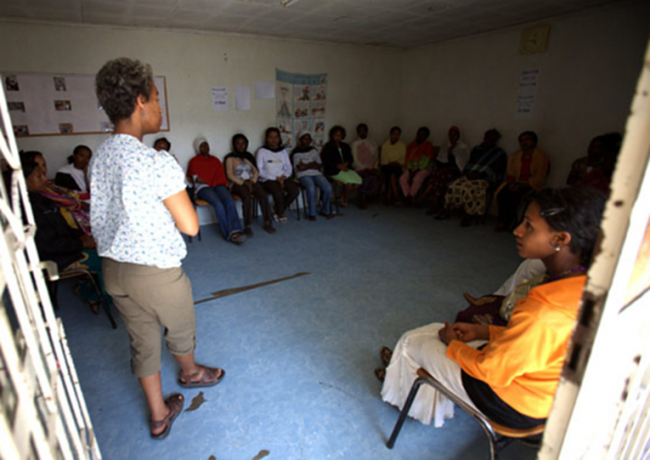 Like many women in Addis Ababa, Ethiopia, a lack of education made it difficult for Almaz to find a job. Desperation drove her to prostitution as a source of income. Almaz soon became pregnant and gave birth to a son, but she was unable to support the child and gave him up for adoption. She found a waitress job in a bar that offered her a mattress to sleep on at night, but gradually she fell back into prostitution. “I went back to prostitution because I just couldn’t make ends meet,” she said. Almaz was trapped in what seemed like an endless cycle. She was abused regularly by the men who used her as a prostitute, and became addicted to drugs and alcohol to ease the pain of a life of prostitution. She also became pregnant again and gave birth to another boy. Other prostitutes in Addis Ababa, Ethiopia, Africa had told Almaz about a shelter, funded by generous Canadians through Samaritan’s Purse, that helped them develop small businesses. Desperate and lonely, Almaz went to see if the shelter could help her. At the shelter, Almaz experienced the healing hand of God. She accepted counseling and treatment for her addictions, and later was able to take business courses to help her leave her of a life of prostitution. While in rehabilitation and schooling, her son was cared for by the shelter’s day care program. Now, Almaz is 27 and addiction-free. She has a business producing candles and baked goods for supermarkets. Her income has doubled. Read how Samaritan’s Purse partners cared for Aisha for eight years before she chose to leave her life on the street for good.